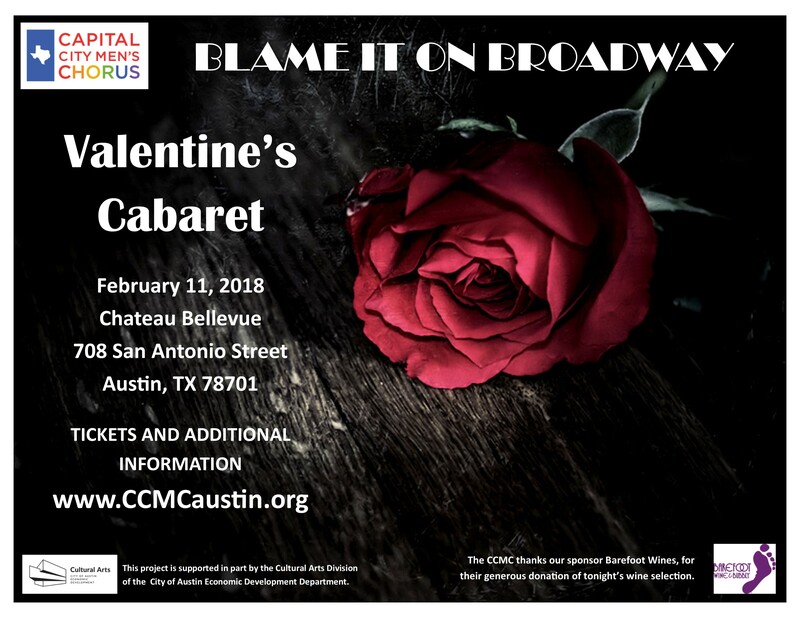 The Capital City Men’s Chorus presents “Blame It On Broadway”, our special Valentine’s Cabaret performance! Treat your special Valentine to dinner and one of the best shows in town, on February 11, 2018! Doors open at 6:30 PM, with show at 7:30 PM. The men of the Capital City Men’s Chorus have put together another of their FABULOUS Valentine Cabaret performances! Featuring numbers by the full chorus, small ensembles, and soloists that will showcase some of the stellar selections of music that can only be found on the stages of Broadway! This wonderfully intimate event will be back at one of our favorite places for Valentine’s Day, the beautiful Chateau Bellevue at 708 San Antonio Street in Downtown Austin. Featuring a three-course gourmet meal, with some of the finest entertainment Austin has to offer: The men of the Capital City Men’s Chorus! The chorus is pleased to announce that we will be joined by Austin’s favorite Emcee, Mr. Rob Faubion, for this year’s performance. Doors open at 6:30 PM, Dinner at 7:00 PM, with the show starting at 7:30 PM. Free parking is available in the chateau’s parking lot. The Chateau Bellevue’s chef is preparing a delicious, three-course gourmet meal. * Vegan option is available upon request. We must have the request for a vegan meal in by Sunday, February 5th. Again, please make sure to get your tickets early, as seating for this event is very limited!